The word "stein" is of German origin. The etymology of the word is either from "Stein Krug" (meaning stone jug/mug) or from "Steingut" (meaning stone goods). Steins are mugs used for drinking beer. They can be made of earthenware, pewter, wood, ceramics, crystal, porcelain, creamware, silver, or glass. They have a handle and a hinged lid; are decorated and sometimes hand-painted. Steins may be traditional, regimental, occupational (depicting one's occupation), character (figural), or relief (three-dimensional). They may be new, antiques, reproductions, or limited editions. Steins range in volume from .03 liter (1 oz.) to 32 liter (8.4 gal. ), the typical volume being .5 (1/2) liter (16.9 oz.). 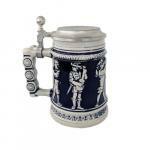 Steins often have a theme such as Christmas, wildlife, dogs, military, sports, game fish, etc. There may also be several steins in a series, within a theme. Europeans often engraved dates on the lids of steins to commemorate specific occasions, such as birthdays, anniversaries, sporting events, weddings, and retirements. Steins originated in the 14th century. As a result of the bubonic plague and several invasions of flies in Europe, Germany established laws to require beverage containers to be covered for sanitary purposes. Around the same time, techniques to improve earthenware by raising the firing temperature of clay, created stoneware. Thus, there was a presence of stoneware drinking vessels with attached pewter lids for the next 300 years. By the end of the 19th century, the stein was clearly defined as being made in Europe, primarily of stoneware and primarily with a permanently attached pewter lid. 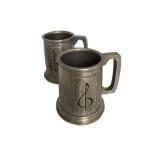 The history of steins includes the development and presentation of steins made with different materials. Pewter was the material of choice in some areas of Europe, especially England. 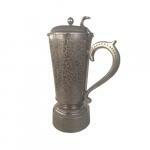 Glass, porcelain and silver steins were introduced several hundred years ago. Many stein-decorating styles and techniques were developed over the centuries, offering further diversity to the stein. In recent times, the stein and tankard industry remained primarily represented by factories in Germany and England, where skilled craftsmen continue to create steins. However, during the 1980's, Ceramarte, of Brazil, became the largest producer of beer steins in the world. They specialize in promotional products for companies and organizations, primarily Budweiser.